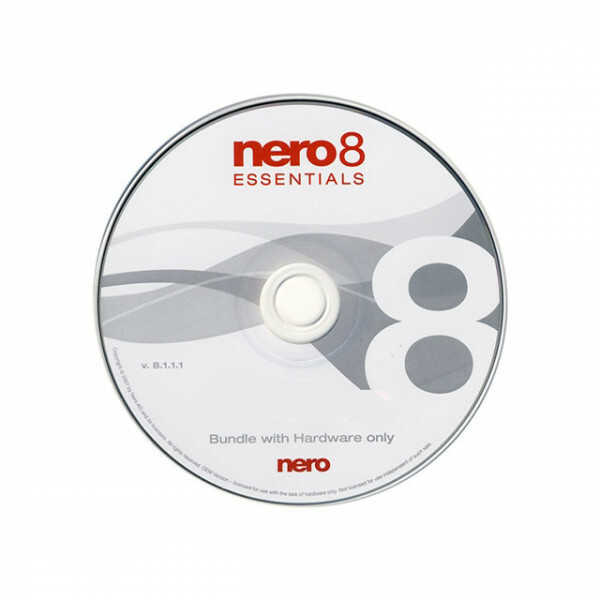 Nero 8, the newest version of the world's best-selling multimedia suite, brings the digital world to your PC. Now it's easy to organize and manage all your multimedia files, as well as create and edit new digital content. Nero's sleek design and user-friendly tools make completing projects fun and enjoyable. This is an OEM product. Direct access to all features from. Xbox 360 and PlayStation 3 streaming features. Blu-ray Disc and HD DVD burning support. Copy a disc with just one click. Graphics optimized for Windows Vista. - DVD-ROM drive for the installation. - Windows 2000 (SP4 or later), Windows XP (SP1 or later), Windows Server 2003 (SP1 or later), Windows XP Media Center Edition Windows Vista. - Gadgets are not available for Windows Vista x64. - Nero ImageDrive currently supports Windows 2000 and Windows XP (32 Bit only). - Windows XP Professional x64, Windows Vista x64 (all applications except InCD, and Nero Scout work in the x86 emulator, which allows 32-bit applications to run). - DirectX 9.0c or better. - Windows Internet Explorer 6.0 or higher. - 1 GHz Intel Pentium III processor, AMD Sempron 2200+ or equivalent. - Minimum 256 MB RAM (for Windows Vista minimum 512 MB RAM). - 1.2 GB hard drive space for standard installation of all components. - Up to 9 GB available drive space for DVD images and temporary DVD files. - Graphics card with at least 32 MB video memory and a minimum resolution of 800 x 600 pixels and 16-bit color settings. However, we recommend 24-bit or 32-bit for true color. - CD and/or DVD/DVD-RAM recorder. - Installation of the latest WHQL (Microsoft Windows Hardware Quality Labs) certified device driver strongly recommended. - Internet connection with DSL 1000 speed or higher for the registration and the update of the Nero 8 help files and other functions. It is also required for the activation of the complete functional range (DVD, MPEG-2, MPEG-4, and AVC), which will be required 30 days after installation. This activation is free of charge. The costs for the Internet connection are carried by the user. - To install Nero 8 you must have administrative rights for all operating systems higher than Windows 2000. - For capturing and burning in real time: at least 1.6 GHz Intel Pentium 4 processor or AMD Sempron 2600+. - At least 1.4 GHz Intel Pentium processor with 256 RAM for TV recording and DVD video editing. - Drive with SecurDisc support. - 16-bit Windows compatible sound devices and speakers.